What’s your next step? Focus on THAT. Where are you placing your toe? Where are you placing your hand? The micro-movements are what lead to the bigger picture outcome. When you get an inspired idea to do something “impossible” you’ve never done before, it’s easy to get overwhelmed by the big picture of ALL the things you don’t know how to do yet, and all that’s at stake if you fail. That would be like never getting in the airplane because “I don’t know how to do this” or climbing out of the open cockpit and staring at the ground, focusing on “OMG it’s a long way down”. Instead, you just take one step at a time, focus on where you are placing your toe, literally, balance in the wind in the moment, and you just DO it. 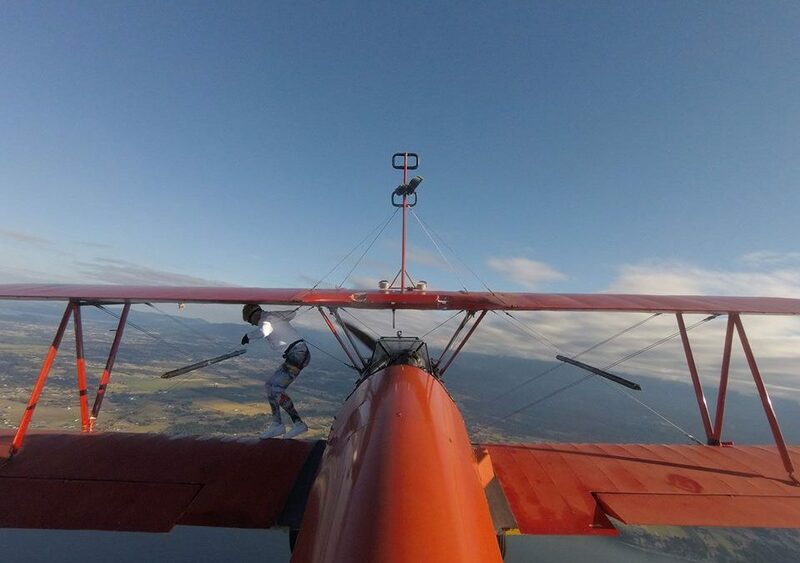 You don’t have to walk on the wing of a biplane in flight. But there’s something that you’ve been wanting to do, be, or have, that you’ve written off as not possible, not available for you, or too hard or scary or whatever. At the end of the day, only you get to decide how you live this one precious life that you have, while you are inhabiting the miraculous body you now occupy, with all the skills and talents and resources you already have. You’re already enough. Decide on your next step, and focus on that. It only looks like “a long way down” if you’re in the habit of focusing on what creates the feeling of fear. Develop the habit of focusing on what makes you feel confident, instead. You’ve got the choice.